CLARKSTON — Matt Dellinger received a long distance phone call at about 11:35 a.m. Wednesday morning. The call came all the way from Afghanistan. Dellinger had a special ceremony on Wednesday, along with three of his fellow football teammates at Clarkston High School. His father, Matt, had an excuse of not being there. So is stationed overseas with the U.S. Armed Forces and had to skip the event. Dellinger, a linebacker and running back, signed with Division I Kent State University for football, one of four Wolves to sign with their official schools on the first day of the NCAA Winter Signing Period. 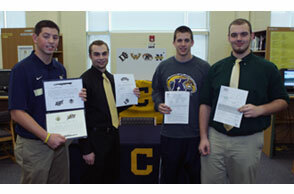 Kicker Alex Barta signed with Division I Navy, running back Joey Goss chose Division II Ohio Dominican and two-way lineman Lucas Sanders picked Division II Wayne State. Dozens of athletes from the www.northoaklandsports.com coverage area signed with schools in various sports or will Feb. 1-7. Barta had plenty of interest from Division II and Division III programs, but the appeal of heading into the Division I Navy Academy was a big draw. He will attend a prep school within the Navy for a year before he can start his collegiate football career. “This means the world to me. We’ve been dreaming this since we were in the seventh grade and now we have the chance,” smiled Barta. “We’ve been working hard at it every summer, kicking and doing a lot of agility. It’s all paying off, all of the time I’ve put in here, the time we’ve all l put in here. For us to be up here signing in front of our family and friends, it means a lot. Sanders is headed to Wayne State, where the Warriors are coming of a national runner-up showing in 2011. That helped Sanders’ decision on joining the Warriors. “It means a lot knowing that some coaches recognize your abilities and they offer you a chance to play in college,” noted Sanders. Goss will be lining up on the other side of the line of scrimmage from Sanders, as both Ohio Dominican and Wayne State are both current members of the GLIAC. Ohio Dominican is located just outside of Columbus. “They were NAIA two years ago and they went D-II and joined the GLIAC last season, so they are a program on the rise and they play in a really tough league,” smiled Goss. “They were telling me that it’s the best D-II conference in the country. “I really liked their coaches and they did a good job of making me feel like home,” continued Goss. “That’s one of the main things that helped me decide to go there. I just felt really at home there. All four of these signees at Clarkston earned All-Area First Team honors in December among multiple postseason honors. This past season, Goss was one of the area’s most dangerous backs with over 1,800 all-purpose yards. He chalked up 944 rushing yards on 165 attempts and scored 15 rushing touchdowns. Goss also displayed some sure hands with 25 catches for 461 yards and four receiving touchdowns and returned 13 kickoffs for 403 more yards and one touchdown. Standing at a beefy 6-2 and nearly 300 pounds on the line, Sanders was simply able to move the football with ease against certain opponents thanks to his interior line play. Sanders earned All-OAA Red Division and All-County Honorable Mention honors this season after helping Clarkston rack up over 30 points a game. Barta’s leg earned him All-OAA Red Division and All-County Honorable Mention honors after he displayed consistency with accuracy and range for the league champion Wolves. This season Barta was 41-for-44 on extra points, 3-for-5 on field goals, punted 33 yards on average and was precise on pinning teams deep into their own territory or drilling kickoffs into the end zone. He chose the Naval Academy over an offer from Michigan Tech. Dellinger committed to Kent State last July and the two-sport athlete, also a fourth-year veteran in basketball, earned All-OAA Red Division and All-County Second Team status last fall. He led Clarkston I tackles and to a share of the OAA Red Division crown and postseason berth. Three other Wolves have not yet reached a decision, including linebacker Zach Collins, wide receiver Mike Schwartz and quarterback Mitch Baenziger. To submit information to www.northoaklandsports.com, e-mail dan.stickradt@northoaklandsports.com. To advertise, e-mail advertising@northoaklandsports.com . Follow us on Twitter @LocalSportsFans and more than a dozen other social media networks. * Have photos or video of this event that you wish to share? E-mail pertinent information to www.northoaklandsports.com Senior Editor Dan Stickradt at dan.stickradt@northoaklandsports.com or e-mail results@northoaklandsports.com. © North Oakland Sports 2019. All rights reserved.